If you don’t have a coach to pin numbers on you, someone will help you! Doing your first show is quite an experience on it’s own. Do you wonder what it’s like backstage? Here are a few behind the scenes secrets. The pump up weights are sick at this show. Tons of weights! Will my coach/husband/friend be allowed backstage? It depends. Some shows allow a ‘helper’ pass. Some shows don’t allow anyone backstage. Some shows require coaches to purchase a coach pass. If your coach is online or you don’t have anyone, someone will help you glue your suit and pin your number on. You will find out all this information on the promoter’s website or at your competitors meeting. Tanning tents: Touch ups and glossing by the onsite vendors. Some glue suits, some don’t.. FYI. Pumping up: Some pump up areas are very extensive with lots of dumbells . Some are minimal. Bring your own band, just in case!! Suitcases, bags, purses, gear all over the place. Everything you need will be with you. I have a rolling bag. I prefer to roll so I don’t have to hoist a bag over my shoulder and mess up my tan. Competitors posing. Practice walking and holding poses so you are warmed up. It’s slippery. Oil is slippery! If someone glosses with cooking spray (OMG) or baby oil.. (I’ve seen it) it’s a hot mess. Some venues put down paper for you to walk of so you won’t slide. Food. I’ve seen trays of cookies, cakes, huge tables of food wonderfully supplied by your promoter. I don’t touch it! I am too OCD for tanned hands to be all over it. That’s up to you.. it’s probably going to be there. You have a long day, bring your own food! This was the backstage area at one show. It was so small only a few people at a time could go back and pump up. You may see people in your show who forgot to train for a show. Just sayin…seen it a lot. It’s real. While you are in line, stay focused. Not the time to be chatty. I’ve met some super awesome ladies backstage and a few who were focused on sabotaging. If someone randomly tells you you are doing quarter turns, when you know it’s half turns.. Don’t listen! If you are nervous, you may fall for it. If you have worked with your posing coach, then you need to do what they tell you. Do what you practiced. If someone says there is a change in the T Walk, tell your coach so they can verify. That could happen, due to time. If you see oil from the body builders on the stage, don’t step in it! T walk and posing on stage is not at all like in practice. Most stages are much bigger than you probably imagined. Lots to think about. One of the stages had ‘grates’ at the front. Definitely avoid that! One stage had feathers and baby oil all over it from a bodybuilding routine. You never know!! You may or may not be able to hear your music during your T Walk. If the promoter plays house music, you’re pretty much going out when the last girl is leaving the stage. I hope you practiced your posing without mirrors! It is sometimes hard to hear the judges also during judging. Be mindful and focus on their cues. No one told me it’s hard to hear. I’ll save you that embarrassment. stage. If you are slouching backstage, thinking no one can see you.. THEY CAN. If you are in line, know you are on camera. When you get your video back, you’ll see who looks like they were on point. Let that be YOU! Likewise, if the girl next to you is pulling out the stripper moves don’t change gears and follow. Stick to what you practiced. Sometimes we check in the night before a show. It’s usually at the host hotel. You will turn in your information packet . They will ask you to write a little ‘thank you to your people’ blurb so they can read it while you do your T walk. Advice: Type it, print it and staple it to the page. I was so carb depleted.. my handwriting was a mess. I over think everything. You will also get your Number to pin on your suit. You might get your goody bag of gifts too. coach or team mates or your mom. That way you know the order of the show and how long your family will have before they ‘have’ to get there to see you. If you are scheduled and it’s required you might do your polygraph then. Don’t sweat the polygraph. Just answer the questions. You’ll be fine. Bring cash. You’ll for sure need to be at the meeting. It might be the night before or in the morning before pre-juding starts. 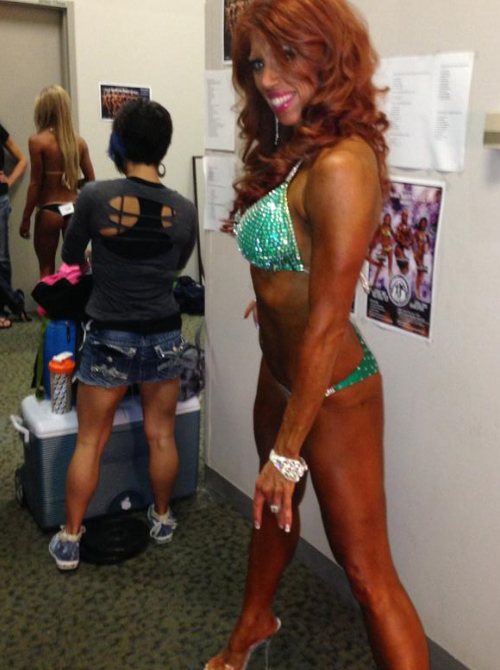 You will have already been up and probably in hair/makeup/tan if you are in the first classes for pre-judging. The promoter will go over how you will queue up and cover things to help the show go smoothly. They may remind you again of the poses and how the judges want to see them. Sportsmanship: You will see various levels of acceptable conduct from competitors and coaches alike. I have seen coaches promise PRO cards to novice girls then have crying messes backstage when they don’t place. I overheard a coach tell his girl, who took third place, that he was going out to the coaches table and “bust some heads”. You never know who will show up that day. You need to be your best on stage and off stage. Crying because you lose a bikini competition is short sighted and reflects badly. Don’t be that girl. PLEASE! This happened: The above girl, refused her third place trophy and refused to submit a urine test. She is now banned in that federation. When 30 girls compete and only 5 place.. someone doesn’t get a trophy! We are not five years old! Poaching: I’m adding this just to make you aware of unscrupulous coaches who will take crying competitors and promise them pro cards if they go with them. I’ve seen it with my own eyes over and over. Coaches I actually thought were good people are unethical. Poaching clients is unethical. If you need help selecting a new coach, read this blog post.